THE PERFECT VALUE PACK FOR CANDLE MAKERS - This set contains an aluminium construction POURING PITCHER + 3 BEAUTIFUL ROUND TIN CONTAINERS for making candles, soaps, and other art & crafts projects. RISK FREE - 100% Satisfaction or your money back - no questions asked. 2 POUND POURING PITCHER with EXTRA BIG SPOUT for easy non-spill pouring. Melting pot is 5.2'' Tall X 5'' Diameter, and can hold up 32 ounces / 2 pounds of wax. It is also great for melting soap base, creams, heating sauces, beverages and more. FOOD GRADE PREMIUM ALUMINIUM CONSTRUCTION - Nature's Blossom's melting pitcher is designed with a HEAT RESISTANT Plastic handle to make sure the handle stays cool during heating and your hand is safe at all times. 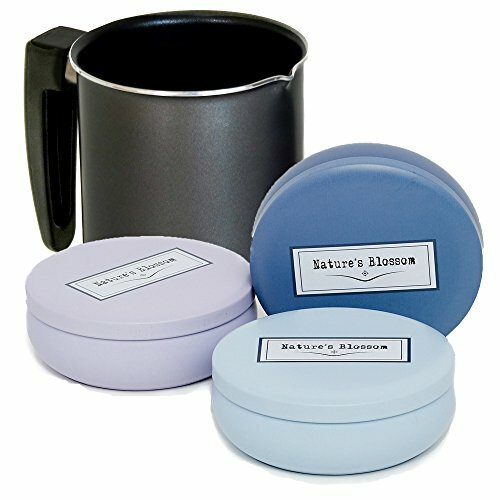 3 LARGE CONTAINERS - 3 decorative tin containers with lids - Comes in 3 different colors - Purple, Lavender & Blue. Jars can hold up to 8 ounces of candle wax and are also great for storing other small items like spices, jewelries and craft projects. Inner coating protects the metal from aggressive fragrances.